To view Part 1, click HERE. 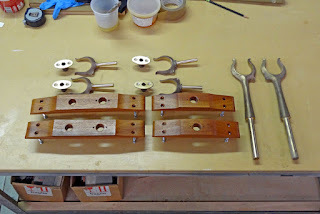 As I mentioned previously, I have to wait to paint the sheer strake until the last fasteners are in, and this means fitting support blocks for the big stand-up rowlocks. These are monumental things that have a big lever arm, so what holds them up has to be pretty strong. 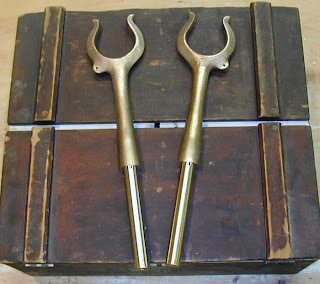 These rowlocks are 15" long, with a 5 1/4" shaft! 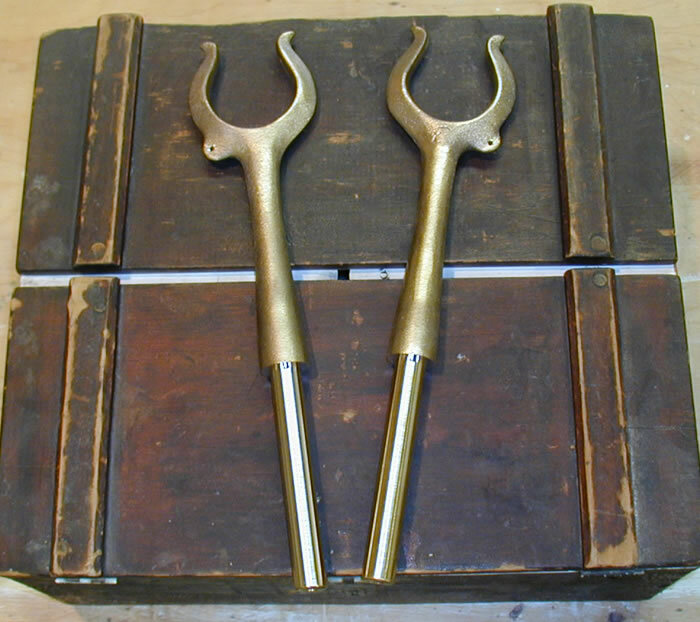 The stand-up locks share the same oarlock pads as the forward most rowlocks. They should be installed fairly close to the center of the boat which will allow pushing the boat either bow or stern first. Mine worked out to be about 6" forward of amidship. 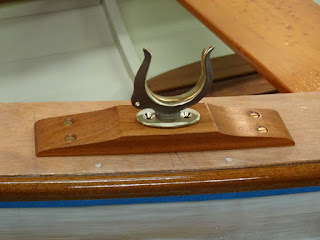 There is comfortable standing space aft of the dagger trunk to push the boat with the oars facing forward, but probably not so comfortable facing aft, because of the forward thwart. We'll see how this all works out. To start with, I plotted the oarlocks' positions on the deck. 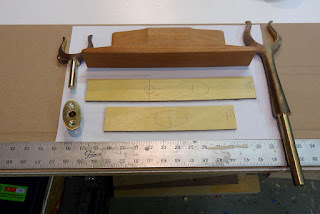 I put the center of each lock about 12" aft of the aft edge of the thwart. On this boat, there are two sitting positions, pulling either two or four oars, and a single stand-up position as I mentioned previously. 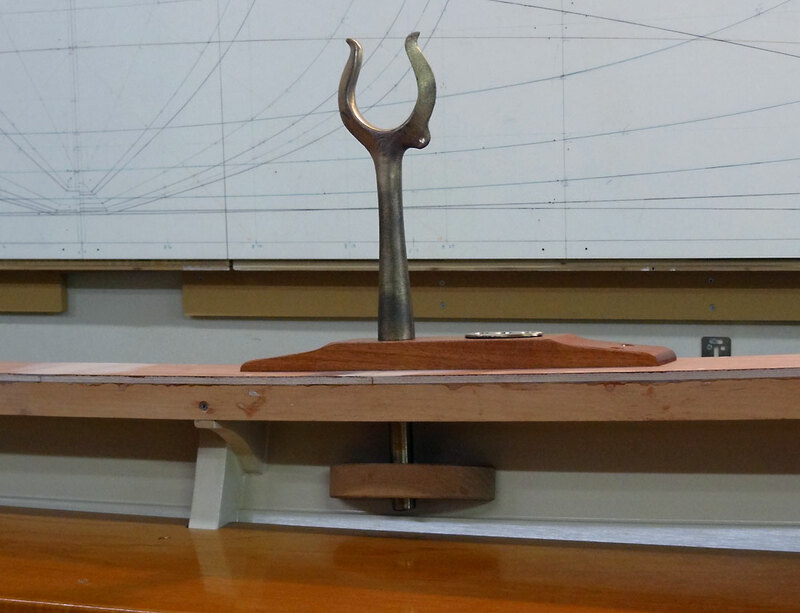 Because of the length of the stand-up shafts, and the flare of the sheer strake, some careful layout was needed to make sure there was room for the shaft to pass through it's support block, and not hit the inside of the plank. 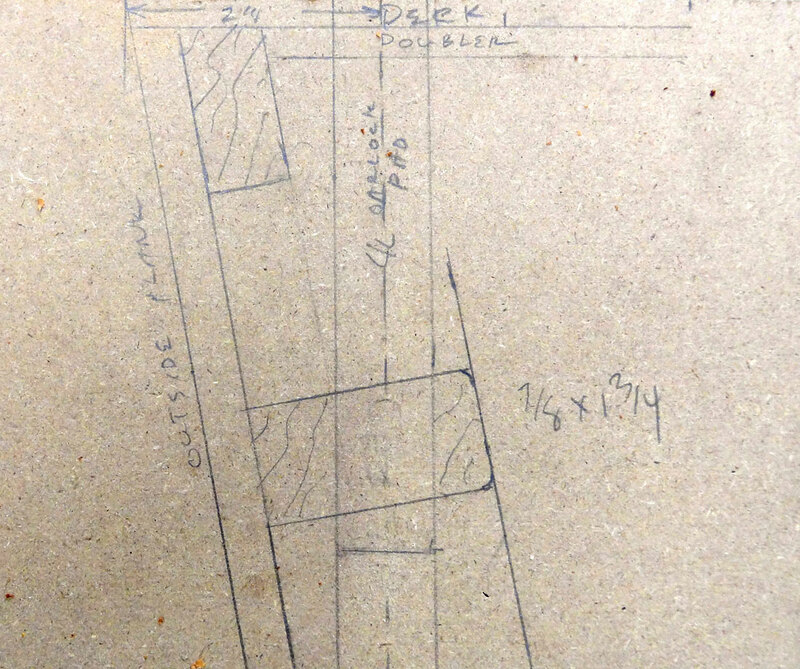 I laid this out in section, full size, to find the location of the pads on deck. 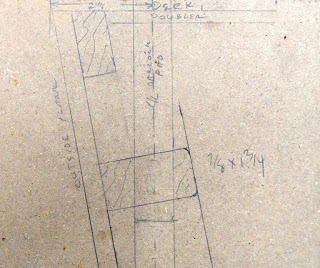 This is a murky photo of the full size layout, on a scrap of mdf. The pads elevate the locks a little above the deck, and provide more bearing for the lock casting than just the decks would. The pads must be curved to fit the deck in plan, and tweaked a little where they bear on the deck to address the very slight twist and concavity as the deck follows the sheer curve. I first made patterns for both sets of pads, and laid out the lock centers on them. 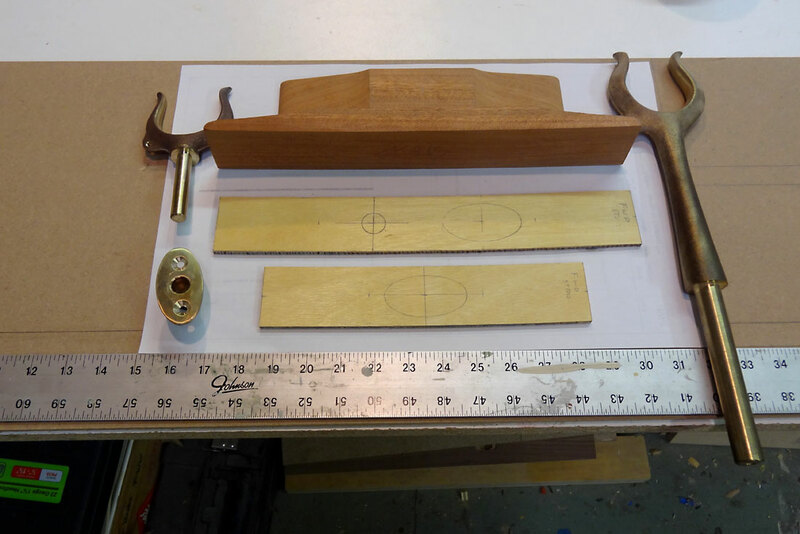 Oarlocks, patterns for the pads, and the pads themselves. The pads need a little profile shape so as not to look clunky, and a long ogee works well for that. I happened to have an appropriate pattern for the edge shape from a previous boat, and dug that out. 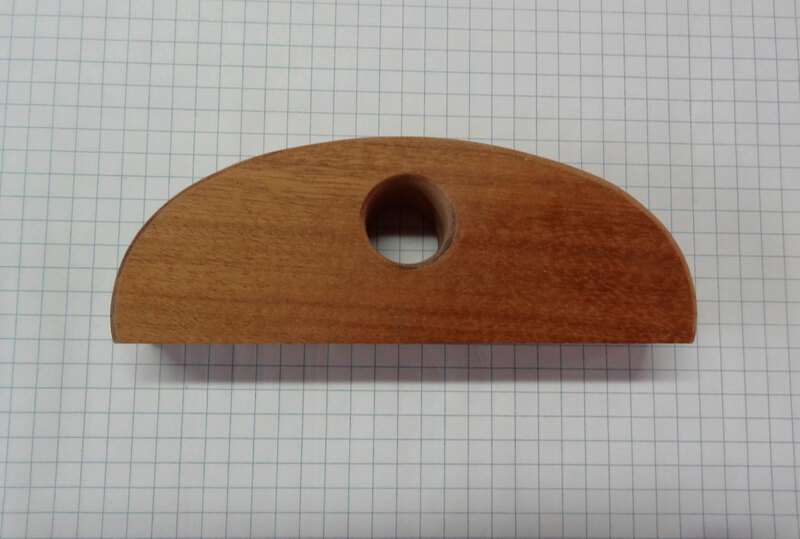 I made the pads from sapele, to match the coamings and rub rails, sawing out the plan curve first, then the profile shape. I cleaned up the ogee cuts on the spindle sander. 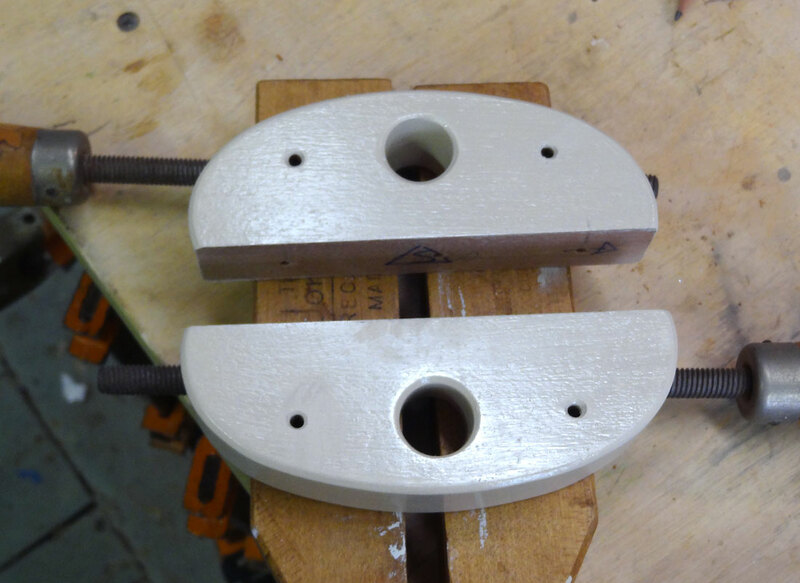 The aft pads have just one hole for the oarlock casting, but the forward pads have this hole, plus the bore for the stand-up lock. 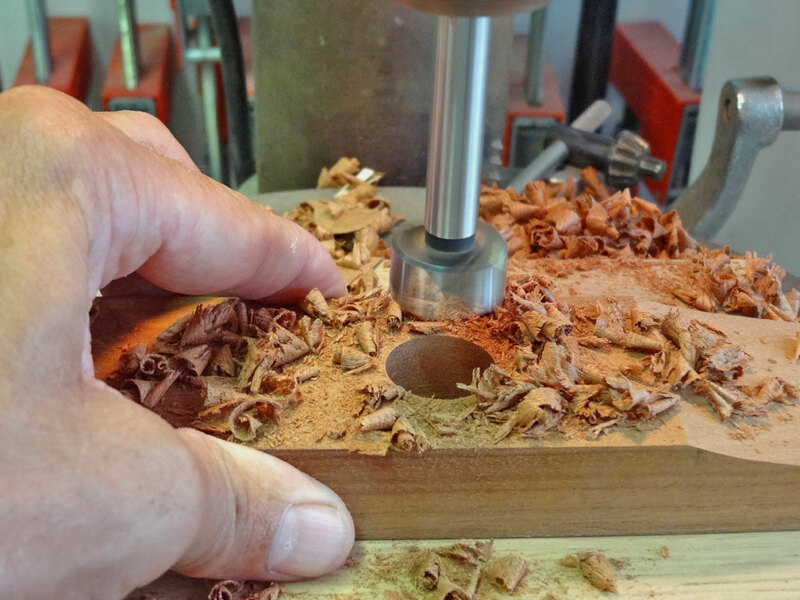 The stand-ups go through wood only. I planned the bores in the pads to be perpendicular to their top surfaces. These were drilled out on the drill press, along with the fastener holes for the pads themselves. The pads are bored on the drill press. 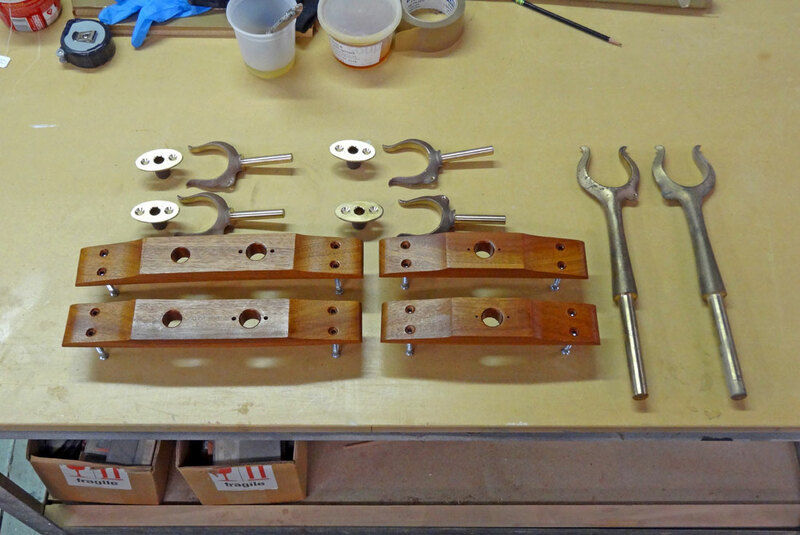 The full set of oarlocks and pads. the pads are shellac sealed. 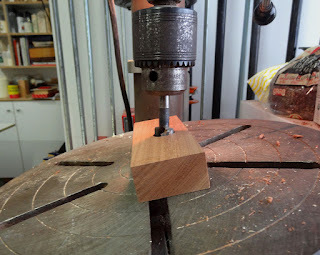 Instead of wood screws, I bored for #10 flat head machine screws. I should mention here that I glued on ply doublers under the deck in way of the pads, for extra stiffness. I clamped the pads on the deck, and bored through the deck for the fasteners. The forward pads have an extra set of machine screws through the bronze lock castings, to provide yet more support for the stand-ups. 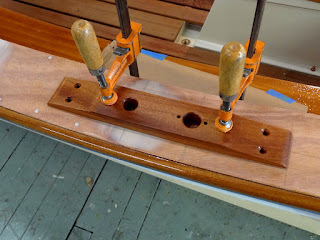 I then put in all the screws and ran the nuts and washers up tight, and bored the shaft holes through the deck, using the pad bores to keep everything lined up. The forward starboard oarlock pad, prior to boring out the deck. 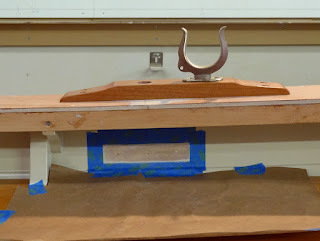 Next I made the stand-up support blocks that get fastened to the inside of the planking. 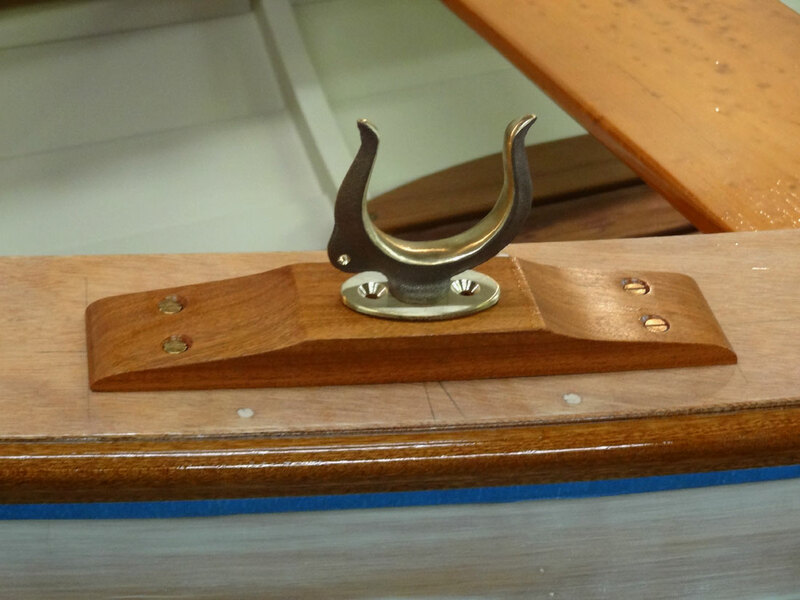 These are sapele also, but were painted to match the inside of the hull. The bore for these blocks is at an angle, which I found in the full size layout that I did. 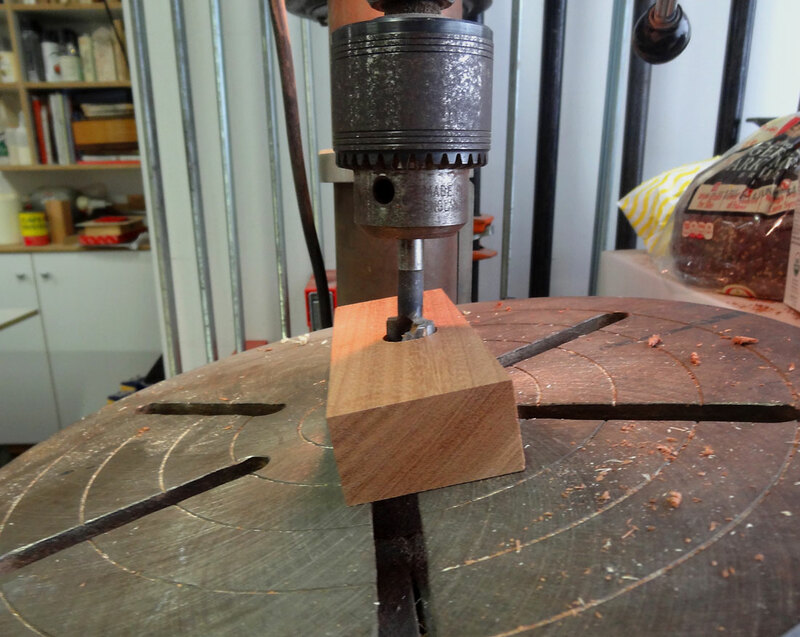 I tilted the table on the drill press, and bored the blocks before shaping them to somewhat of an oval. The support blocks, before lanyard holes were drilled. It occurred to me (not too late for once) to also bore small holes for rowlock lanyards. These lanyards keep the locks from being lost overboard (I have a good $300 in oarlock hardware on this boat!). Inside the boat, I taped off the locations of the support blocks, and sanded away the paint for a good epoxy bond to the plank. 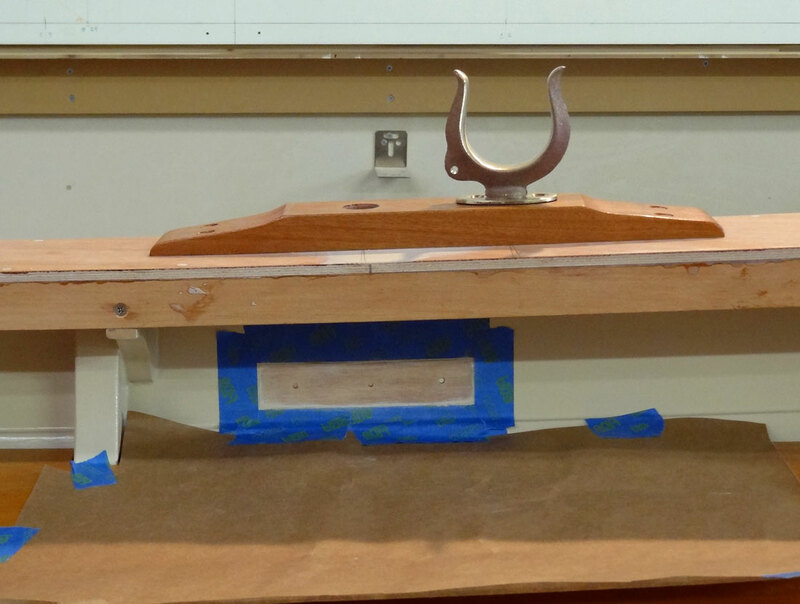 Paint is sanded away to permit bonding of the support block. Before gluing them in though, I primed and painted the blocks, and carefully checked the fit of the rowlock shafts through the pads and blocks. I then installed them with screws through the planking. Now I can paint the sheer strake at any time. ... and the blocks are painted prior to installation (note lanyard holes). I'll put several coats of varnish on the pads, and finish-paint the deck before permanently installing them. I don't want to glue these on, but will bed them right on the painted deck with an oil base bedding compound. I had glued Cricket's pads on with epoxy, then had to chop them off with a big chisel when I wasn't satisfied with their placement. Live and learn! The starboard aft pad, in position. The oarlock locations are evident in this shot. A final note, while we are on the subject of oars. 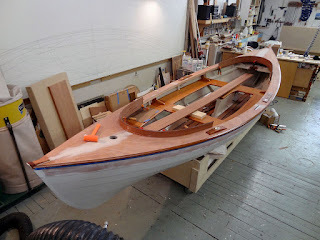 I've been thinking about what style oars I might make for this boat, out of what material, and how much time it will take, when out of the blue a nice pair of Shaw and Tenney's of the right length, kind of materialized. Ashok, my shop assistant was up in the Catskills on vacation and stumbled on a perfect pair, in an antique store of all places. The oars are quite old (maybe 30 or 40 years?) and belonged to the proprietor's dad, but they were little used, and have only a patina to show their age. $125! Quite a good deal. These oars have copper tips too, and are leathered and buttoned. The grips seem a trifle short, and I wonder if they were cut at some time to fit in a particular space. Anyway, we'll see how they work and I can always add a little length to the grips later if need be. For now though, that's one less thing to worry about. 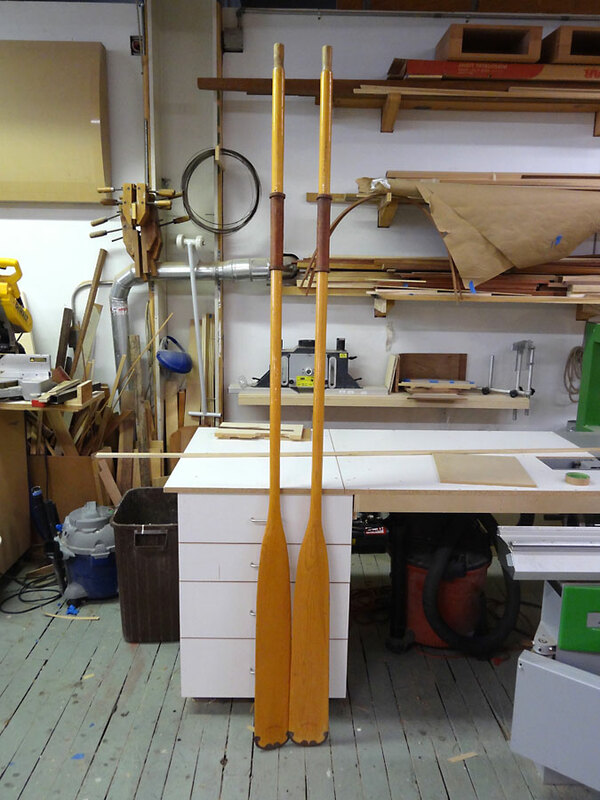 A pair of 8' Shaw and Tenney spruce oars.